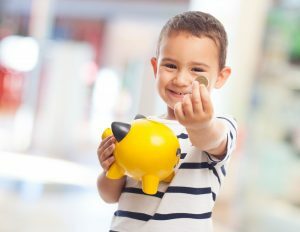 Begin by teaching your child how to give and save. Start at the earliest possible age. A toddler is not too young. Your child can learn about generosity and financial self-discipline before he is old enough even to spell the words! From a very young age, your child can unconsciously master a basic financial skill-set that will gradually become his default instinct. Give some, save some… then spend some. That will be his norm. Teach him how to spend. Then, if later, during a period of teenage rebellion or young-adult immaturity, he departs from it, he’ll know where to return. Giving and saving are foundational precursors for your child’s future financial success. God has given us a biblically-stated formula for how to use money. Giving ultimately leads us to experience more, not less. That is God’s way. Saving strengthens our self-discipline and maturity. These attributes will serve your child in every future endeavor of his life: education, sports, career, home, and even marriage. But the pay-off doesn’t wait until adulthood! At every stage, as he practices giving and saving, he’ll develop a natural confidence, contentment, and financial maturity. We all need these financial lessons in order to navigate this world effectively. It’s not too late for a teenager. Start today and stay with it! Character takes time to shape. But never doubt the power of consistent training. Single drops of water, falling consistently over time, can dissolve stone. Your child is unlikely to articulate his thanks for financial prowess. But you, as a parent, can be assured you have truly prepared him to financially succeed. When he grows up to receive regular paychecks for work well done, he’s going to find it easy and natural to give and to save. Unlike those who are financially unskilled, your child won’t be caught off guard by the gross figure appearing on his first paystub. He already knows money is not intended to be fully spent. Because he has already experienced the pleasure and power of giving and saving, he is going to avoid much financial heartache, including the nightmare of debt. Amazing opportunities await him! Having proved faithful in giving, he’s proven himself ready to receive. He’s prepared to manage more. And then, there’s this: A child who starts saving 10% in his twenties is likely to be a millionaire in his forties.